Dream sleep and dreaming are associated with high levels of brainstem arousal and right cerebral activity. One indication of dream sleep is the rapid lateral movements of the eyes: Rapid Eye Movements: REM. Most dreaming occurs during REM, and REM has also been found to be associated with brainstem arousal, right hemisphere activation, and low-level left hemisphere arousal (Goldstein et al. 1972; Hodoba, 1986; Meyer et al. 2007). 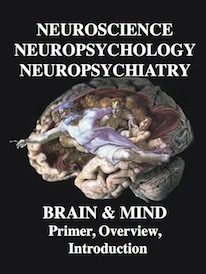 Based on an extensive review of scientific studies, the overwhelming evidence indicates that whereas the brainstem activates the right hemisphere during dream sleep, and is thus physiologically responsible for REM (the eye movements being mediated by brainstem cranial nerve 6), the dream contents have their source in memories and impressions stored within the right half of the brain. However, the right hemisphere not only dreams the dream, which the left hemisphere, being at a low level of arousal passively observes, but it stores the dream in right hemisphere memory. In consequence, it becomes progressively more difficult to recall one's dreams as one spends time in or awakens during NonREM (Wolpert & Trosman, 1958), which is associated with high left hemisphere and low right brain activation (Goldstein et al. 1972). Thus are dreams really forgotten, or are they locked away in a code which is not accessible to the speaking left hemisphere? Although up to five stages of sleep have been identified in humans, for our purposes we will be concerned only with two distinct sleep states. These are the REM (rapid eye movement) and non-REM (N-REM) periods. N-REM occurs during a stage referred to as "slow-wave" or synchronized sleep. In contrast, REM occurs during a sleep stage referred to as "paradoxical sleep." It is called paradoxical, for electrophysiologically the brain seems quite active and alert, similar to its condition during waking. However, the body musculature is paralyzed, and the ability to perceive outside sensory events is greatly attenuated (reviewed in Hobson et al. 1986; Steriade & McCarley 2010; Vertes 2010). Most individuals awakened during REM report dream activity approximately 80% of the time. When awakened during the N-REM period, dreams are reported approximately 20% of the time (Foulkes, 1962; Goodenough et al. 1959; Monroe et al. 1965) However, the type of dreaming that occurs during REM vs. N-REM is quite different. For example, N-REM dreams (when they occur) are often quite similar to thinking and speech (i.e. lingusitic thought), such that a kind-of rambling verbal monologue is experienced in the absence of imagery (Foulkes 1962; Monroe et al. 1965) It is also during N-REM in which an individual is most likely to talk in his or her sleep (Kamiya, 2011). In contrast, REM dreams involve a considerable degree of visual imagery, emotion, and tend to be distorted and implausible to various degrees (Foulkes, 1962; Monroe et al. 1965). 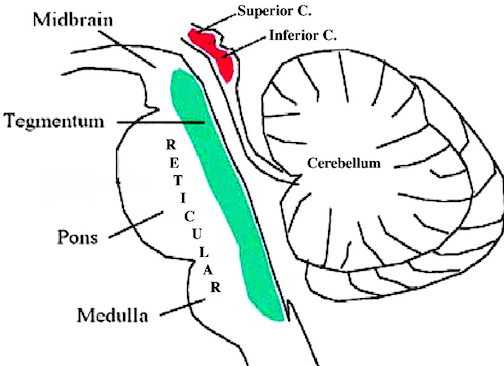 REM is characterized by high levels of activity within the brainstem, occipital lobe, and other nuclei (Hobson, et al. 1986; Steriade & McCarley 2010; Vertes 2010) It also has been reported that electrophysiologically the right hemisphere becomes highly active during REM, whereas, conversely, the left brain becomes more active during N-REM (Goldstein et al. 1972; Hodoba, 1986). Similarly, measurements of cerebral blood flow have shown an increase in the right temporal and parietal regions during REM sleep and in subjects who upon wakening report visual, hypnagogic, hallucinatory and auditory dreaming (Meyer et al., 2007). At least one group of investigators, however, have failed to find significant hemispheric EEG differences between REM and NREM (Ehrlichman et al. 1985). 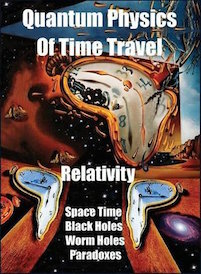 There is some evidence to suggest that during the course of the day and night the two cerebral hemispheres oscillate in activity every 90 to 100 minutes and are 180 degrees out of phase --a cycle that corresponds to changes in cognitive efficiency, the appearance of day dreams, REM (dream sleep), and, conversely, N-REM sleep (Bertini et al. 2007; Broughton, 2002; Gordon et al. 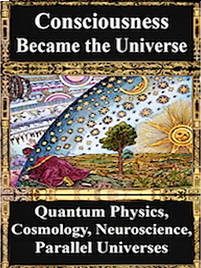 2002; cited by Hodoba, 1986; Klein & Armitage, 1979; Kripke & Sonnenschein, 2003; Levie et al. 2007, cited by Hodoba, 1986). That is, like two pistons sliding up and down, it appears that when the right cerebrum is functionally at its peak of activity, the left hemisphere is correspondingly at its nadir. Conversely, there have been reports of patients with right cerebral damage who have ceased dreaming altogether or to dream only in words (Humphrey & Zangwill, 1951; Kerr & Foulkes, 1978, 1981). For example, defective dreaming, deficits that involve visual imagery, and loss of hypnagogic imagery have been found in patients with focal lesions or hypoplasia of the posterior right hemisphere and abnormalities in the corpus callosum (Botez et al. 1985; Kerr & Foulkes, 1981; Murri et al. 1984). An absence or diminished amount of dreaming during sleep also has been reported after split-brain surgery; i.e., as reported by the disconnected left hemispehere (Bogen & Bogen, 1969; Hoppe & Bogen, 1977). Similarly, a paucity of REM episodes have been noted in other callosotomy patients, although these particular individuals continued to report some dream activity (Greenwood, Wilson, & Gazzaniga, 1977). On the other hand it has been reported that when the left hemisphere has been damaged, particularly the posterior portions (i.e. aphasic patients), the ability to verbally report and recall dreams also is greatly attenuated (Murri et al., 1984; Pena-Casanova & Roig-Rovira, 1985; Schanfald et al. 1985). Of course, aphasics have difficulty describing much of anything, let alone their dreams. Moreover, Language Axis disconnection from the right hemisphere would also account for this failure to verbally report dreams and related imagery. In some respects, however, a parallel between these latter findings and those of Risse and Gazzaniga (1979) in their amytal studies may be explanatory regarding the failure to report dreams with left hemisphere lesions. 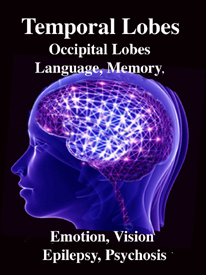 That is, with left hemisphere damage or when it is at a low level of arousal, the ability to verbally recall or report events experienced or generated by the right hemisphere appears to be reduced; i.e., the left (speaking) half of the brain cannot remember because it cannot gain access to right cerebral memory centers. In the intact, normal brain, everyday experience memory traces appear to be stored unilaterally rather than laid down in both hemispheres (Bures & Buresova 1960; Doty & Overman 1977; Hasegawa et al., 2014; Kucharski et al. 2010; Levy, 1974; Risse & Gazzaniga, 1979). This is because each hemisphere is specialized to perceive and process certain types of information, which is then unilaterally stored in teh riht or left half of the brain. 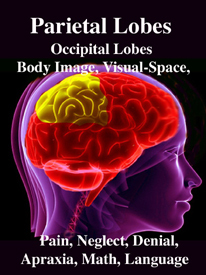 In contrast, right temporal lesions or lobectomy significantly impairs recognition memory for tactile and recurring visual stimuli such as faces and meaningless designs, memory for object position and orientation, and visual-pictorial stimuli, and short-term memory for melodies.. Similarly, memory for emotional material is also significantly impaired with right vs left cerebral lesions including the ability to recall or recognize emotional faces (DeKosky, et al. 1980; Fried et al. 2002; Weddell, 1989). Individuals with right hemisphere damage also have more difficulty recalling personal emotional memories (Cimino et al. 1991). Hence, it is the left hemisphere which is responsible for the encoding and recall of verbal, temporal-sequential, and language related memories, whereas the right cerebrum is dominant in regard to visual-spatial, non-verbal, and social emotional memory functioning. Each hemisphere stores the type of material that it is best at recognizing, processing, and expressing. 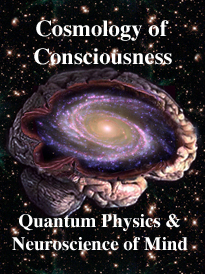 Consequently, during right hemisphere REM-dreaming, visual and emotional memories and images predominate. 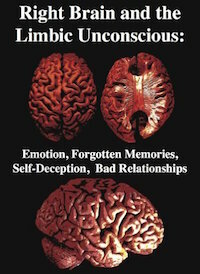 Therefore, in the normal brain, and during sleep and dreaming, when one hemisphere learns, has certain experiences, and/or stores information in memory, this information is not always available to the opposing hemisphere; one hemisphere cannot always gain access to memories stored in the other half of the brain. To gain access to these lateralized memories, one hemisphere has to activate the memory banks of the other brain half via the corpus callosum (Doty & Overman, 1977; Hasegawa et al., 2014) or anterior commissure (Kucharski et al. 2010). This has been demonstrated experimentally in primates. For example, after one hemisphere had been trained to perform a certain task, although either hemisphere could respond correctly once it was learned, when the commissures were subsequently cut, only the hemisphere that originally was trained was able to perform--i.e., could recall it. The untrained hemisphere acted as though it never had been exposed to the task; its ability to retrieve the original memories was now abolished (Doty & Overman, 1977; see also Hasegawa et al., 2014). This indicates that when exchange and transfer is not possible, is in some manner inhibited, or if for any reason the two halves of the brain become functionally disconnected and are unable to share information, the possibility of information transfer at a later time is precluded (Bures & Buresova, 1960; Hasegawa et al., 2014; Kucharski et al. 2010; Risse & Gazzaniga, 1979) -even when the ability to transfer is acquired or restored. The information may become lost to the opposite half of the cerebrum. Nevertheless, although inaccessible or lost, forgotten dreams, like forgotten memories can be suddenly recalled. It is not at all uncommon to recall the previous evenings dream by some common everyday experience. Tthe right hemisphere provides the physiological foundation from which dreams in part derive their source and origin (Goldstein, et al. 1972; Hodoba, 1986; Joseph, 1988a; Meyer et al.,2007). However, in some instances in which these dream centers are disconnected from the language dominant left hemisphere, due to posterior right or left hemisphere lesions or after callosotomy, the ability to recall, report, and/or to produce vivid visual and hypnogogic dream imagery is attenuated (Joseph, 1988a, 2010). Likewise, because the left hemisphere is at a low level of arousal during dreaming and REM sleep, it is often unable to "remember" the dream upon waking. In addition to dream production, the right hemisphere also appears to be the dominant source for complex non-linguistic hallucinations. Specifically, tumors or electrical stimulation of the right hemisphere or temporal lobe are much more likely to result in complex visual as well as musical and singing hallucinations, whereas left cerebral tumors or activation gives rise to hallucinations of words or sentences (Berrios, 2010; Halgren, et al. 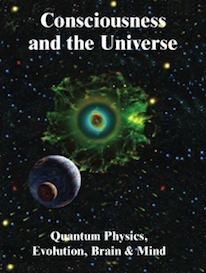 1978; Hecaen & Albert, 1978; Jackson, 1880; Mullan & Penfield, 1959; Penfield & Perot, 1963; Teuber et al. 1960). 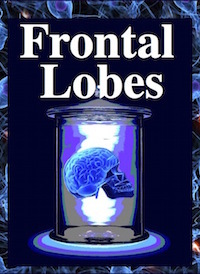 Conversely, LSD induced hallucinations are significantly reduced following right but not left temporal lobe surgical removal (Serafetinides, 1965), and dreaming is sometimes abolished with right but not left temporal lobe removals (Kerr & Foulkes, 1981). In one study, however, it was reported that an alcoholic patient with a right subcortical injury and left sided neglect, experienced hallucinations only in the right (non-neglected) half of visual-space (Chamorro et al. 2010). It is important to note that some investigators believe the left hemisphere is responsible for dreaming and the production of images (see Greenberg & Farah, 1986; Miller, 2010 for a detailed review). In fact, some investigators have claimed that the left (posterior) hemisphere is "dominant" for the production of imagery (Farah, 1989; Trojano & Grossi, 1994), and/or that it is faster at generating images from categorically stored (language related) information (Findlay et al. 1994). Unfortunately, those making these claims appear to have confused apraxia, agraphia, and disturbances of language as somehow indicative of imagery deficits, and/or the ability to quickly verbally describe a verbal "image" as somehow synonymous with imagery production. For example, in some studies, patients were required to verbally describe and/or draw the object they have "visualized" (e.g. Farah et al. 1988). In other words, imagery production was not assessed, but drawing and verbal ability. those imagery experiments with individuals with left posterior lesions are equally suspect in that a common abnormality would be word finding difficulty. Thus, these left cerebral "imaginal" deficits appear to be more a function of naming and word finding disturbances coupled with visual agnosia and/or apraxia -disturbances associated with left posterior (parietal) injuries (see also Trojano & Grossi 1994). 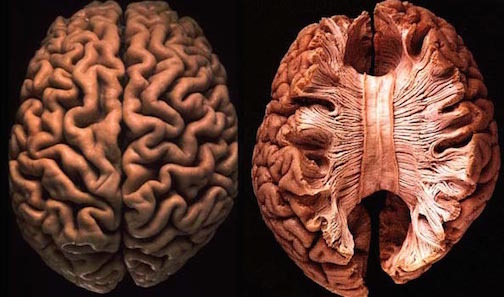 Individuals with left hemisphere damage have difficulty accurately describing much of anything, let alone visual images which is clearly more the productive province of the right hemisphere. Indeed, those who champion a left cerebral dominance for imagery have very little evidence to support their claims and instead appear to be confusing disconnection syndromes and apraxic and language disorders for imagery deficits (see also Sergent 2010). Nevertheless, the left cerebrum no doubt can produce a variety of images, especially in response to a verbal command (Goldenberg 1989). However, as noted above, right (but not left) cerebral injuries can result a failure or inability to generate half of visual images (Bartolomeo et al. 1994) -which indicates that in the absence of right cerebral input, the left hemisphere is producing only a partial image and is therefore lacking dominance in this regard. Since the right hemisphere utilizes a form of visual-spatial and emotional language which the left hemisphere does not speak, dream imagery often seems incomprehensible to the language dependent half of the brain, even when it is providing the accompanying narrative or dialogue. Rather, the non-temporal, often gestalt nature of dreams appears to require that they be consciously scrutinized from multiple angles in order to discern their meaning, for the last may be first and what is missing may be just as significant as what is present (Freud 1900; Jung 1945, 1964). This is because the right hemisphere analyzes and expresses information in a manner much different form the left. Moreover, in that the right hemisphere is at a higher level of activation during REM, it also tends to predominate when attempting to analyze internal and external sensory input during this stage of sleep. For example, although sensory perception is restricted, the right cerebrum may respond to a sensation experienced during sleep by creating a dream to explain it. However, when this occurs we sometimes dream backwards. A case in point, "Trish" dreams she is walking in San Francisco lugging large bags of gifts. Feeling tired she sets them down on the sidewalk. She looks for a bus and see a cable car coming. As it pulls up the conductor begins to ring its bell. The sound of the bell grows louder and then jolts her awake. Fully awake she realizes that someone is ringing her doorbell. In this regard, the hearing of the bell seemed to be a natural part of the dream, and it is. What seems paradoxical, however, is that the dream seemed to lead up to the bell so that its ringing made sense in the context of the dream. The dream did not lead up to the bell, however, for the bell initiated the dream. The dream was produced, via the unique language of the right hemisphere during sleep (as well as amygdala activation), so as to explain the sound of the bell. The bell was heard and the dream was instantly produced in explanation and association. The bell stimulated the dream (perhaps by startling the amygdala; see chapter 13) which may have only last a second. Since most dreams often last only a few seconds (although they may seem to take place over the course of hours) and since the right hemisphere does not analyze in temporal and linear units, the sequence of events is not all that important, that is, to the right half of the brain. Fortunately, backward dreams are the most easily comprehended because the left cerebrum recalls the dream from its ending forward, and then like a reflection from a mirror reverses all that is perceived so that it makes temporal-sequential sense. Backward dreams also tend to be devoid of hidden meanings. For example, one individual (described by Freud, 1900) dreamt he was in 18th Century France in the midst of the French Revolution. After a trial in which he was been found guilty, he was being led down a street lined with yelling and cursing Frenchmen and women. At the end of the street he could see the gallows where the heads of various political criminals were being chopped off at the neck. Mad with fright he felt and saw himself led up the stairs and his head being placed in the yoke of the chopping block. The executioner gave the signal, the crowd screamed its approval, he could hear and sense the blade falling, and with a loud crack it struck him across the neck. Indeed, it struck him with such a jolt that he awoke to find that his poster bed had broke and that a railing had fallen and struck him across the side and back of his neck. Although dreams probably serve a number of purposes, and at times are highly improbable and bizarre, they sometimes reflect something significant about the mental and emotional life of the dreamer, as well as other issues of concern to the right half of the brain. 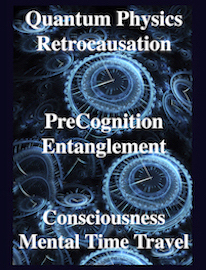 For example, when subjects are awakened repeatedly during REM over the course of several days, often an evolving thematic pattern, like an unfolding story, can be discerned (Cartwright et al. 1980). These patterns frequently reflect mental-emotional activity concerned with the solution of particular problems (Cartwright et al. 1980; Freud, 1900; Joseph 1992b; Jung, 1945, 1964; Kramer et al. 1964). 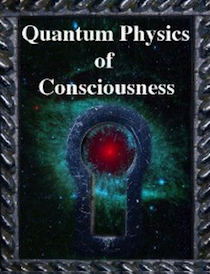 For example, one subject, a student, noted that "after being woken many times and seeing three or four dreams a night, I could realize there was a certain problem being worked out, like coping with responsibilities that were thrust upon me, but that weren't necessarily my own but I took on anyway. It was working out the feelings of resentment of taking somebody else's responsibility, but I met them well in my dreams. A good thing about spending time in the sleep lab was you could relate a common bond to some of the" dreams (Cartwright et al., 1980, p. 277). Similar bonds and patterns were, of course, recognized by Freud (1900) and Jung (1945) many years ago. 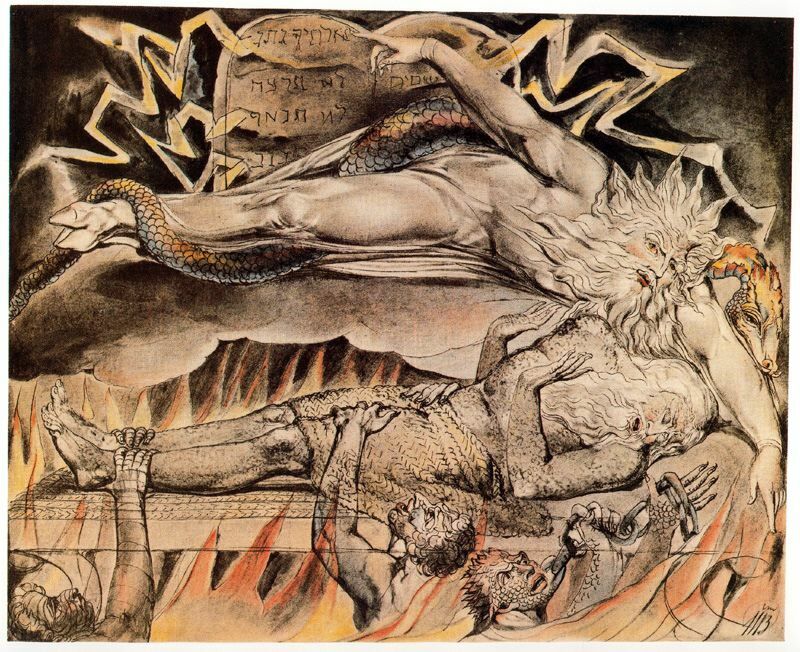 Given right cerebral dominance for emotion and dream production, it is perhaps not surprising that emotional conflicts and traumas are often represented via dream imagery (Freud, 1900, Joseph, 1992b; Jung, 1945). Consider, for example, Sara, who was described by her parents as a "very good and obedient" 6 year old girl who suffered from "night terrors" (Joseph, 1992b). Specifically, she frequently woke up at night screaming about the "creek," that ran near her home. According to her mother, Sara was afraid because she had been told that hoboes lived under the bridge and to never go there without her mommy or daddy, because they would "get" her. I had Sara tell me her dream. Sara: "I'm walking on the sidewalk near the big creek. Then I go to the edge and stare down at the big rocks at the bottom. All at once the whole world starts to shake. Like it's turning upside down. It's trying to throw me into the creek. I get scared and start to be afraid and start grabbing at the trees and bushes to keep from falling into the creek and onto the big rocks. Sometimes I see this hole and I crawl in. Then everything is OK. Sometimes I fall and fall and fall and I can see the big rocks coming closer and I know I'm going to fall on them. When I fall on them I wake up 'cause it hurts." Sara had this particular dream repeatedly. Was it really because she was afraid of the hoboes and the creek? In Sara's case it is noteworthy that her parents fought, screamed, yelled, and argued almost non-stop and there were constant threats of divorce. From talking within Sara it was also apparent that she was traumatized by her parents constant fighting -although they were both ostensibly quite good to her. Nevertheless, Sara's world was being turned up side down and was in complete chaos, which was reflected in her dreams. Sara also had another troubling and recurrent dream where she went riding on her bike and when she came back to her street, her house was gone. Every house on the street was the same, including the neighbors. But when she asked about her family, no one knew what she was talking about and no one recognized her. Although the symbolic content of these dreams was not apparent to Sara or her mother, one need not be a psychiatrist to decipher their obvious meaning. Sara's emotional world was literally being turned upside down and was in chaos due to the horrible fighting engaged in by her parents. She was terrified of losing her home and the catastrophe she perceived as befalling her family. Her very identity and functional integrity as a person was at stake, for if she lost her family she lost her Self. The dream imagery involving the hole that she climbs into is also very interesting in that it suggests the desire to return to the safety and security of the womb. On the other hand, the hole" may have been exactly that, a hole. Indeed, dreams frequently mean exactly what they seem to mean (Jung, 1945). Nevertheless, it might reasonably be asked, if dreams are of importance and not merely reflective of random and purely confabulatory ideation, why are they so difficult to recall? In part, as noted in the introduction to this section, this may be a function of lateralization, alterations in hemispheric arousal and activity, differential memory storage, and decreased interhemispheric communication during REM. Perhaps they only can be recalled by the right hemisphere. Of course, in some instances, dreams are probably nothing more than mundane and confabulatory noise produced by the brainstem and random memories and sensory impressions. The brainstem is the most "ancient" portion of the brain, as creatures with fully formed brainstem 500 million years ago swam the emerald seas. 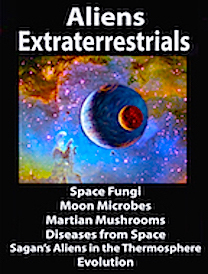 Although it is unlikely that these creatures or their immediate ancestors dreamed dreams, the brainstem is vital to dream production, as well as consciousness, arousal, and sleep. 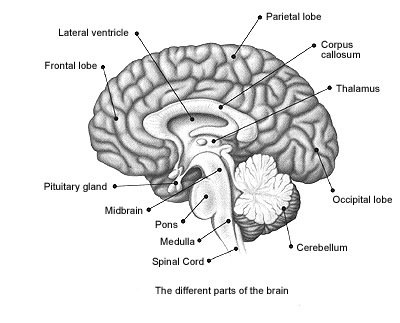 Many of the functions performed by the brainstem are not only reflexive and stereotyped but characterized by specific oscillating rhythms, such as heart rate, breathing, swimming, crawling, walking, waking and sleep, including the oscillation between REM and NonREM. A considerable number of neurons located in the midbrain and pons display a bursting, oscillating rhythm -a pattern that also accompanies controlled locomotion and a host of other cyclic activities. This includes 5HT and NE neurons which are also involved in controlling a wide variety of rhythmic functions, including respiration, chewing, and micturation (Skinner & Garcia-Rill, 2010) as well as sleep and dreaming. 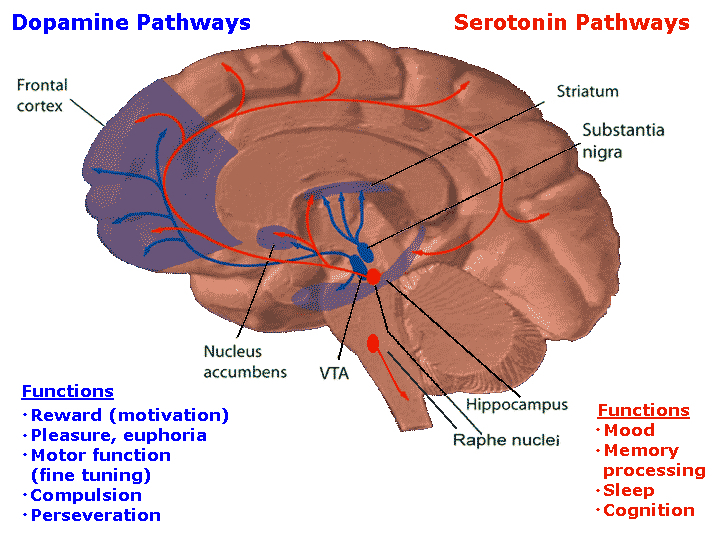 Presumably, these interconnected monoamine, cholinergic and catecholaminergic neuronal clusters are out of phase which induce cyclic oscillations (Skinner & Garcia-Rill, 2010) including those involved in sleep and dreaming. It is now well known that the visual-emotional hallucinatory aspects of dreaming occur during REM, whereas more thought-like and verbal ideational patterns are produced during NREM. A variety of nuclei and brain regions appear to be involved in the production of REM, i.e. 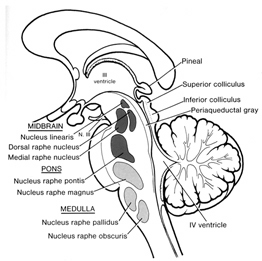 the amygdala, hippocampus, right temporal lobe, and especially brainstem nuclei located in the lateral and medial pons. Specifically, cholinergic neurons located in the lateral pons, and neurons located in the medial pontine reticular formation appear to be the locus for REM-on neurons which initiate and/or maintain the production of REM sleep (see Steriade & McCarley, 2010; Vertes 2010). That is, during the production of REM and paradoxical sleep, there is increased cholinergic activity in these regions, whereas with the termination of REM, these same neurons have greatly reduced their activity. Similarly, when cholinergic agnonists are injected into the medial pons, REM sleep is produced (Steriade & McCarley, 2010). When cholinergic agonists are injected into the lateral pons, muscle atonia is produced -a common characteristic of paradoxical sleep. Thus, REM on cells tend to be cholinergic and become very active during paradoxical sleep, induce muscle atonia, but markedly decrease their activity during slow wave and non-REM sleep at which point atonia also tends to disappear. 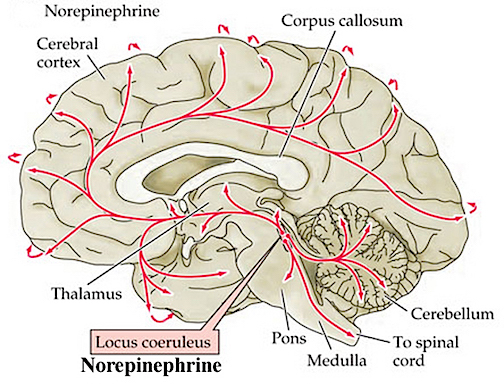 In contrast, REM-off neurons, which tend to be located in the medial raphe nucleus (which contain 5HT neurons) and in the locus coeruleus (located at the midbrain-pons junction and which contain NE neurons) are highly active during waking but then begin to reduce their activity during slow wave sleep and then significantly decrease their activity with the initition and onset of REM and the production of pontine, lateral geniculate, occipital activation; i.e. PGO waves (see Steriade & McCarley, 2010; Vertes 2010). Conversely, experimental cooling (and thus deactivation) of the LC consistently and repeatedly induces REM sleep (Cespuglio et al. 2002). Hence, these REM-Off neurons appear to suppress REM and PGO activity and interfere with the onset of dreaming and paradoxical sleep, whereas REM-on neurons initiate the opposite sleep phase in which case the brain appears to be highly active (e.g. the amygdala, pons-geniculate,-occipital lobe) and the individual begins to dream. REM-on and REM-off neurons, therefore, appear to oscillate in a rhythmic fashion thus inducing sleep, dreaming, and waking. When the REM-off neurons cease to fire, the REM-on neurons (which are predominately cholinergic) become highly active until a REM episode is produced. However, as REM-on neuron activity decreases, REM-off activity increases, thus setting into motion a continuous 90 minute cycle of REM - Non-REM sleep alteration. In addition, and as noted above, whereas NE and 5HT (i.e. sensory motor neurons) play a significant role in the generation of dream (paradoxical) sleep, GABA and glutamate (modulatory) pace maker neurons, also play a significant role in the oscillation between REM and NREM, in part by acting on REM-off neurons. 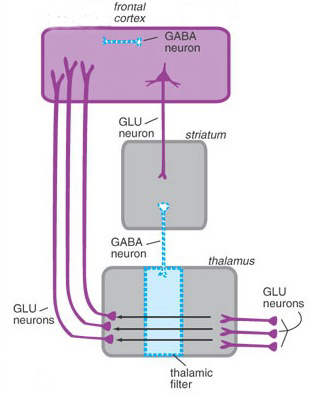 That is, REM-off neurons are turned off by modulatory inhibition (GABA), whereas REM-on neurons are turned on by modulatory excitation (glutamate). However, these latter oscillating on/off activities appear to take place not only in the brainstem, but in the hypothalamus. That is, because the hypothalamus (via the suprachiamatic nucleus) is also involved in pace maker functions, whereas the posterior hypothalamus is involved in sleep (Sherin, et al., 1996) there is some evidence to suggest that this GABAergic inhibition may actually begin in the hypothalamus thus initiating sleep onset and the first sleep stage (NREM). 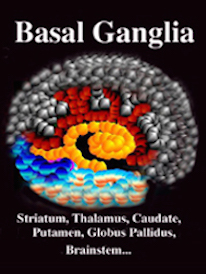 GABAergic inhibitory actions then slowly spreads to and then throughout the brainstem only to become self-inhibiting and replaced by glutamate (excitatory) secretion which triggers REM-on neurons, and thus the next stage of sleep (REM). Because of these on/off excitatory/inhibitory activities, during NREM NE and 5HT levels decline (Hobson, et al., 1975; Lydic, et al., 1991). However, ACh levels actually increase (Hobson, et al., 1975; Lydic, et al., 1991) and in fact remain at high levels during REM and the production of pontine, lateral geniculate, occipital activation; i.e. PGO waves (see Steriade & McCarley, 2010; Vertes 2010). 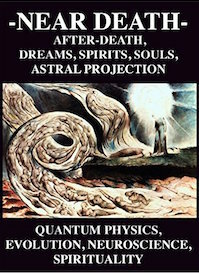 As ACh is also implicated in memory, this may well explain whey recent memories tend to become incorporated in dreams. Paradoxical sleep and the production of dream states are associated with the development of high levels of activity within the pons, the lateral geniculate nucleus of the thalamus, the occipital lobes, and association and motor cortices (Steriade & McCarley, 2010) -activity collectively referred to as PGO waves (see Hobson et al. 1986). Presumably, as these neurons are activated, visual imagery is produced as these regions are concerned with analyzing visual input as well as visual scanning of the environment. However, PGO waves, although generated in a variety of brainstem reticular neuronal clusters, are also induced by amygdala activation (Calvo, et al. 2007). In addition, during REM, the hippocampus begins to produce slow wave, theta activity (Jouvet, 1967; Olmstead, Best, & Mays, 2003; Robinson et al. 1977), which is associated with long-term potentiation which is associated with learning and memory (see chapter 14). 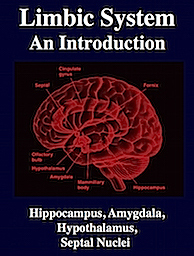 The amygdala, in concert with the hippocampus, therefore appears to contribute emotional and visual imagery and experiential impressions to the dream state--a theory first proposed by this author (Joseph 2002, 1988a, 1992a) and which has subsequently been embraced by numerous investigators. 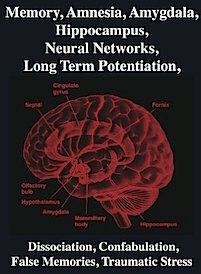 Indeed, via the extensive interconnections the amygdala maintains with the brainstem and the geniculate and occipital lobes, and its capacity to induce high levels of arousal, this nucleus is ideally situated to initiate if not produce (again in conjunction with the hippocampus) the auditory-visual imagery characteristic of the dream state including all aspects of related emotion (see chapter 13). 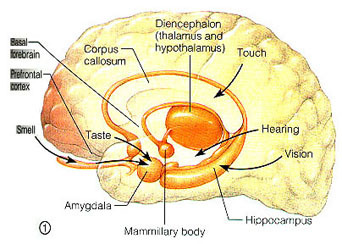 Moreover, the amygdala also receives 5HT and NE from the brainstem (with which it is intimately interconnected), thereby creating an elaborate feedback circuit. 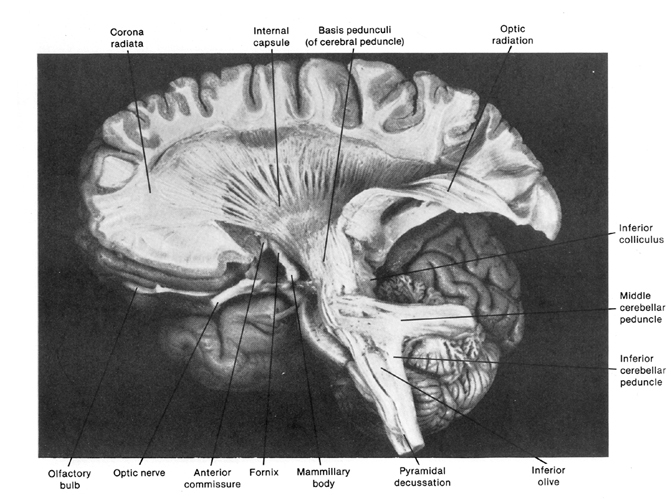 The lateral pontine reticular formation is also involved in producing hippocampal theta during REM (Vertes, 1984). As detailed in chapter 14, hippocampal theta is associated with arousal, and theta activity may represent the introduction and transformation of hippocampal based memory-imagery into dream imagery. However, the production of hippocampal theta may also help insure that whatever is experienced during REM sleep is stored in such a fashion that dream stimuli do not become committed to memory. 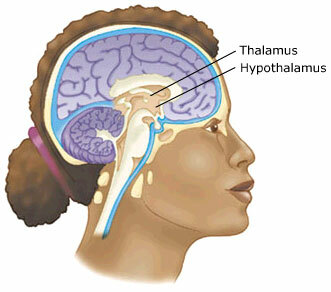 Nevertheless, in regard to dream sleep, the amygdala and hippocampus appear to be largely dependent on the brainstem, for when disconnected (see below), although the brainstem continues to demonstrate a sleep wake cycle, the forebrain will cease to demonstrate paradoxical sleep activity. Moreover, although the amygdala can induce PGO activity, in general, neurons in the upper medial pontine reticular formation begin to fire well in advance of the development of PGO waves (McCarley & Ito, 2007). It is also these pontine neurons (in conjunction with the cranial nerves and midbrain) which initiate eye movements during REM. Typically, PGO waves reach their maximum amplitude in the lateral geniculate nucleus of the thalamus which (like the amygdala) are also cholinergically responsive (Steriade & McCarley, 2010). It is noteworthy that PGO-on neurons also become active during waking when eye movements are made (Nelson et al. 2007). Therefore, PGO waves are not strictly a phenomeon associated with sleep, but can occur when the subject is emotionally aroused and perhaps looking anxiously around for the source of stimuation -which again implicates the amygdala in their production. Characteristically, however, PGO waves and their transfer to the thalamus has two distinct states (Steriade & McCarley, 2010). That is, they first appear during the last stages of synchronized sleep just prior to REM, and then again, accompanying the development of desychronized sleep and REM. Although NE and 5HT neurons appear to make a major contribution to the development of sleep and dreaming, REM is also dependent on activity within the midbrain reticular formation -activity which presumably includes excitation of the superior (visual) colliculus which in turn can trigger eye movements and orienting reactions to sensory stimuli. Midbrain reticular activity during waking and REM is twice that during slow wave sleep (Steriade & McCarley, 2010). Midbrain reticular neurons also markedly increase their activity during the transition from slow wave to REM sleep. Conversely, if the midbrain is transected, REM does not appear in the forebrain, although all associated components are preserved in the brainstem, including REM (although reduced), muscle atonia, and the pontine contribution to PGO waves (Hobson et al. 1986; Steriade & McCarley, 2010; Vertes 2010). Transection of the lower (medulla) brainstem does not significantly effect REM sleep (Siegel et al. 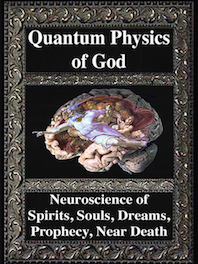 1986), which again implicates the midbrain and pons as the dream-sleep generators. However, they also contribute to the waking state as well. For example, midbrain reticular neurons tend to significantly reduce their activity immediately prior to spindle production as well as during the transition from wakefulness to sleep and during drowsiness (Steriade & McCarley, 2010). However, reticular activation can also abolish the thalamic production of spindles, such as occurs during waking and paradoxical sleep. Hence, brainstem stimulation or activity can either inhibit or promote spindle wave production and induce paradoxical as well as slow wave, synchronized sleep. The defining feature of synchronized (or quiet, Non-REM) sleep is large amplitude rhythmic EEG waves of varying frequencies (from slow to fast). Even during waking, however, and when highly aroused or alert, some cortical areas may display synchronized EEG activity, whereas even during REM sleep some cortical areas display synchronized activity (rSteriade & McCarley, 2010). Presumably in that some cortical areas demonstrate slow wave activity whereas yet others are highly aroused, is a reflection of selective attention and discrete neocortical activation. Some cortical regions becomes suppressed thus narrowing the range of incoming stimuli whereas other specific regions remain activated in order to process incoming information and/or for the purposes of contributing to whatever mental process may be taking place. Steriade and McCarley (2010) propose that the development of synchronized sleep is dependent on the removal or lessening of brainstem input and is a passive rather than an active process. That is, fluctuations and decreases in cholinergic and non-cholinergic activity within the reticular formation decreases thalamic activity thus producing sleep spindles in the reticular thalamic nucleus followed by synchronous activity. However, with increases in cholinergic and non-cholinergic activity, thalamic activity increases, and synchronous EEG activity is replaced by desynchronization and the production of REM (see also Hobson et al. 1986; Vertes 2010). Given that the thalamus acts to relay sensory input to the neocortex, not surprisingly thalamic neurons are also involved in synchronized and paradoxical sleep. Specifically thalamic neurons inhibit sensory transfer to the neocortex during the synchronized sleep stage as well as during the transition from wakefulness to sleep and when drowsy; otherwise the individual would keep waking up due to neocortical activation. Some thalamic neurons, however, act to enhance sensory transfer during desynchronized sleep (Steriade & McCarley, 2010) as well as during waking. Presumably this allows for sensory stimuli to become incorporated into and to in fact induce dream states. 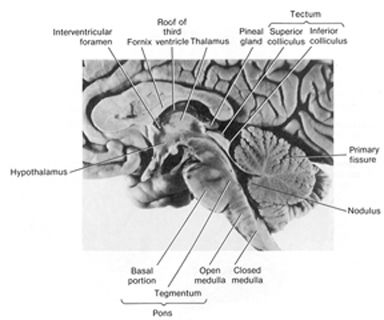 Specifically, the reticular thalamic nucleus appears to also act as a "pacemaker" center for the development of sleep spindles (i.e. EEG waves which wax and wane between 7 and 14 Hz) and which herald the onset of sleep (Steriade & McCarley, 2010). Spindles are typically associated with loss of consciousness and thalamic inhibition and thus loss of information transfer to the cortex. 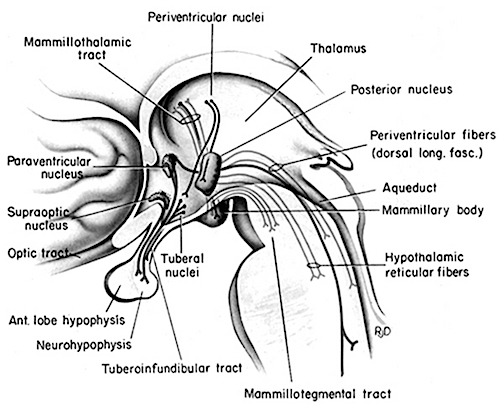 Moreover, spindles originate in the reticular thalamus, which in turn projects to other thalamic neurons. 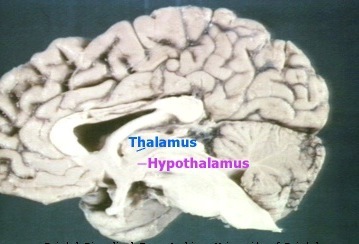 These thalamic nuclei are indirectly under the control of the frontal lobe and dorsal medial thalamus (see chapter 19). 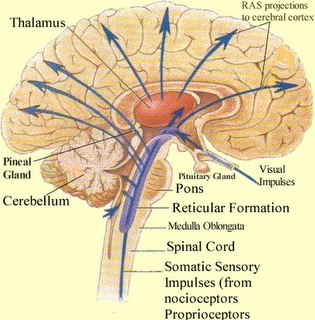 The frontal lobe as well as brainstem motor areas become activated during REM (see Steriade & McCarley, 2010). However, although motor commands may be initiated and even transmitted from the neocortical motor centers, they cannot be acted out during REM due to the production of muscle atonia. Muscle atonia is produced, in part, via descending 5HT influences on the spinal cord (see above). Specifically, during the transition from slow wave to paradoxical sleep motor neurons in the brainstem and the spinal cord come to be actively inhibited (Chandler, et al. 1980; Chase & Morales 1985). The result is muscle atonia, or what has also been referred to as sleep paralysis. This condition is almost exclusively associated with REM sleep (Chase & Morales 1985). Presumably these inhibitory influences arise within the pontine and bulbar brainstem reticular formation and via descending 5HT influences so as to prevent an individual from motorically acting out their dreams and possibly injuring themselves (e.g. sleep walking). Indeed, the dorsal lateral portion of the pontine tegmentum has been repeatedly implicated as responsible for muscle atonia during sleep (see Steriade & McCarley, 2010). By contrast, lesions of the pontine reticular formation (with sparing of the locus coeruleus) abolishes muscle atonia (Hendricks, et al. 2002; Jouvet, 1979). In consequence, during REM sleep, the animal will move about and engage in semi-purposeful behaviors, including walking, orienting movements, and attack -as if the animal were acting out its dream (Hendricks, et al. 2002).